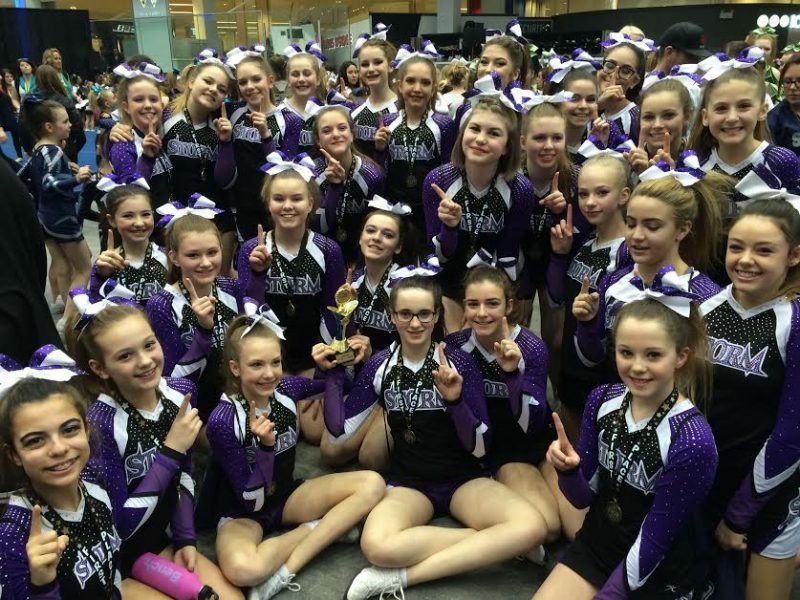 All star cheer is one of Canada’s fastest growing sports and it is quickly gaining popularity across the world! In fact, cheerleading is on its way to being recognized as an Olympic sport. It is a fun team activity that combines all the athletic components of sport such as strength, power, flexibility, endurance, fitness and mental tenacity. It also helps athletes increase their body awareness and self-esteem and develops leadership and communication skills. Athletes in this sport work toward developing skills such as tumbling, jumping, stunting, performance skills, dance and team work. At Perfect Storm Athletics we have cheer teams for athletes age 3.5 & up and for beginners through elite athletes. For more information on the different levels of cheerleading, please click here: Levels of Cheerleading. Runs in three sessions: Fall (September to December)m Winter (January to March), and Spring (May-June). Teams for ages 3.5-12 as well as an adult team (Fall session only). Registration fee (fall and winter) includes a Perfect Storm shirt to be worn at practices and their performance. There is no uniform. For more information on our rec teams, please read our Program Handbook.